Taking music lessons and owning an musical instrument can be both challenging and fun. Fun, because learning how to play music and learning how to play a particular instrument can bring a lot of enjoyment to one’s life. Challenging, because music requires practice and dedication, and owning an instrument requires a bit of responsibility. If you’re thinking about taking violin lessons, or if you’re thinking about purchasing a violin, the tips below will help you maintain your instrument and bow, and extend the life of your instrument. Musical instruments are to be treasured and well cared for, and violins can be especially fragile at times. Be sure you handle your instrument with care, and store it properly in its case when not in use. Be sure your instrument is not left on the floor, where it can be stepped on, or on the edge of a table top, where it can fall. Be especially careful with your violin bow, as it is delicate and should only be used when playing your violin. It’s important for a violinist, whether a beginner or a more advanced musician, to apply rosin to the violin bow before playing. The rosin helps prevent friction between the instrument and the bow, and is very important to maintaining your violin and taking care of it for long term. Over time you will develop a sense of how much rosen to apply. After you play or practice your violin, it’s important to wipe it down. The strings of your instrument may have a buildup of rosin, and that will interfere with the sound quality of your playing. Wipe your strings down carefully to eliminate any residue buildup. Also, be careful not to touch the hairs on your bow with your fingers – the oil from your hands will soak into the hairs which can damage your bow and interfere with your practice. Dust can buildup on the inside of your instrument. Once or twice a year, clean the inside out: just put about ½ cup of dry rice into the F holes. Gently shake and swirl the rice around and then shake out the rice. This will help remove and buildup from the inside of your violin. When you’re not playing your violin, it’s important that you loosen the bow, to ensure that the hairs are not under stress. Also, be sure to loosen the strings on your violin if you won’t be playing it for a while (for example, while on vacation). By loosening the strings you help eliminate stress and pressure on the bridge and strings. 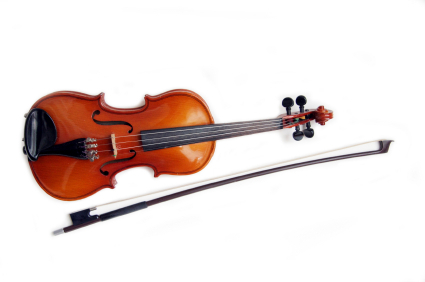 Violins, like many instruments, are sensitive to weather and temperature swings. Try to avoid volatile temperature fluctuations and humidity, which can damage both the bow and the violin. You will need to rehair your bow every now and then, depending on how much you play and how well you take care of your instrument and bow. Ask your local music store to show you how to tell if your bow hairs need replacing.